I take great pride in the trains I work on and run on the layout, so it is unthinkable for me to leave the trains out overnight. I also didn't want to carry all the equipment out each time I wanted to operate the layout. Plus, most of the trains are very detailed and it would be easy to break things off by picking them up frequently. So, I needed a solution. My plan was to run the trains off the layout behind the outdoor fireplace to a door cut in the train room. It was going to be semi-permanent with two lift out bridges. One bridge runs from the layout to behind the fireplace. The other bridge is from where the tracks end to the building. This will make much more sense with the pictures below! A unique feature is that I split the track behind the fireplace so that one track ascended and one track descended to the heights of the shelves inside the building. Each shelf has four tracks with 22' trains to the railroad. After the trains run out from the building, they can go to Main 1, Main 2, or the RhB tracks. For an example, let's pull out the Maintenance of Way train. The 2' X 3' door was built into the building specifically for this purpose. The MOW train is on the top storage shelf. The shelves are located in the train room. The 22' long cabinet was custom built and contains over 500' of track. Twenty glass paneled doors allow access into the cabinet to access the trains. The lower two shelves connect to the transition track, allowing for 170' of storage to easily run out to the layout under power. 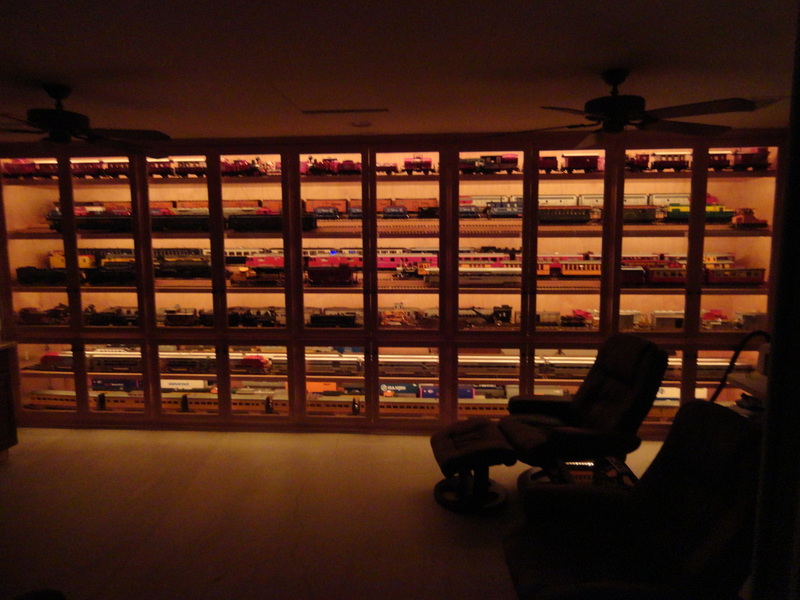 500' of storage track is built into this one of a kind display case.